A modern fairy-tale about the indelible, unpredictable bond between a boy, his dog and political agitprop. I’m fairly new to the world of Wes Anderson’s films, though I will admit to having loved Fantastic Mr. Fox and its incredible stop-motion animation. 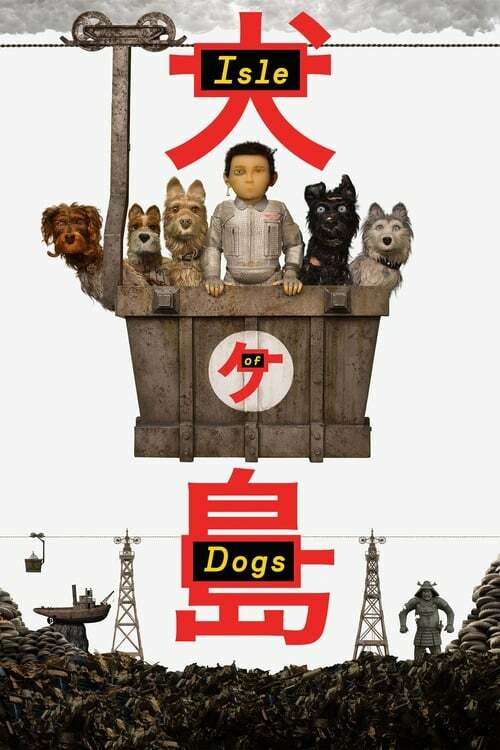 I’ve wanted to see Isle of Dogs ever since it was first announced with a trailer showing terrified stop-motion dogs in what looked like an entirely Japanese setting. Since then, I’ve boned up my Anderson cred and binged nearly everything I could get my hands on. Even still, I wasn’t quite ready for what he had in store with his second animated effort. In some undetermined future dogs everywhere have been affected by a highly contagious sickness that has infected the entire canine population. In Japan, a decree by Mayor Kobayashi says that all dogs are to be deported to a nearby trash island (referred to as Isle of Dogs, obviously) where they will remain until further notice. As a show of good faith he sends his nephew’s dog, Spots, to be the Island first canine citizen. Events fast-forward to six months later and Kobayashi’s 12-year old nephew, Atari, is searching for Spots by any means necessary. He crash lands a plane onto the island and is rescued by a pack of motley pack of “alpha dogs”, who typically lead themselves by taking a vote, though usually defer to the street smart Chief (Bryan Cranston), a stray who’s been on his own for years. The dogs agree to help Atari, referring to him as the ‘Little Pilot’ throughout the movie, and together they go off in search of the elusive Spots to reunite him with his master. During their journey Chief is reluctant to help the Little Pilot, even when prompted by the other dogs. He does step up however when a fight breaks out, facing off against a mechanical canine to protect Atari, and staying by his side despite his reluctance to help him. Over time, Chief comes to build a bond with the boy and starts to realize there may be more to having a master then just having a warm place to sleep at night. There’s a strong bond between owner and dog that runs deeper than words can describe, the same bond that fueled Atari to venture to the island to find Spots. Isle of Dogs isn’t your typical animated fare; Japanese characters speak their native language and subtitles are few and far between – unless characters are on TV or there’s something that needs translated onscreen. This accentuates the language barrier between humans and dogs, with the story told from the latter’s point of view. Dogs only understand a handful of words and commands, but can pick up on humans’ tone of voice, facial expressions, and hand gestures. This is demonstrated beautifully throughout the film as it forces viewers to focus on visual cues happening onscreen to decipher what’s going on. When Atari points his finger down at the pack of dogs I understood he meant “sit”, despite the language barrier. In another flashback scene he and Spots are introduced, though Spots is the only character speaking English. Atari is reaching out to pet his new bodyguard dog when he’s admonished by his uncle’s creepy right-hand man, Major Domo. Besides Spots, you can’t understand verbally what the characters are saying, but from their facial expressions and the tone of their voices you’re able to pick up on Atari isn’t meant to be befriending his new bodyguard. There are several small touches like this throughout the film and it made me appreciate these small flourishes all the more. Director Wes Anderson did an amazing job of giving each canine a voice and personality all their own, even though some of the film’s more subtle political messaging may fly under the radar. The English-language cast (mostly dogs) should be immediately familiar to longtime Anderson fans as they’ll recognize Bill Murray, Jeff Goldblum, Edward Norton, as well as other high-profile actors known for their blockbuster and indie roles, including Cranston’s Chief. Fans will have fun trying to guess who’s-who among the cast (and yes, that is Yoko Ono). But don’t let the cute pooches fool you; there are moments that were oddly graphic and bloody without being overly grotesque, like how in one of the opening scenes Chief tears the ear off of another dog. About a minute later, you see rats dragging the ear off for a quick snack. A detailed quick-montage of sushi preparation may startle some unsuspected viewers, though is so visually imaginative we don’t mind having our expectations chopped up and served for our joyous consumption. Isle of Dogs is filled with insane and predictable little moments like these, but at its core is a story about the lengths a boy will go to find his beloved furry friend. Using English/Japanese language may seem an odd choice, but this adds to the inherent difficulties we all feel when trying to communicate with each other in normal life, let alone a dystopian future where dogs have been criminalized (there’s a cat conspiracy, but I’ll leave that for viewers to discover). That such a charming story is presented in beautiful stop-motion animation only sweetens the deal, proving once again that Wes Anderson films are anything but predictable.